Designing a home gym can be a cost-effective way to put your fitness goals in reach — and with a little preparation, you don’t necessarily need to leave the comfort of your home to have a great workout. It seems like Fitness is on everyone’s mind, from celebrity wellness gurus to ordinary wage slaves. The fitness biz is a $28 billion dollar mega-industry, and Americans spend money on everything from gym memberships and classes, to home equipment and a full range of lifestyle products and foods. Most homes today have a fitness machine of some kind — or at least a set of dumbbells, but as with any home environment, the key to success is creating space you want to be in. A well conceived and designed workout area, whether it’s for yoga practice or heavy bag work, needs to be both functional and motivating. Space is key, but the good news is you don’t need a mansion to have a comfortable and inviting home gym, and since you won’t need plumbing or a lot of complicated wiring, that space can be set up almost anywhere in the home. Most designers and architects agree that the basement is a logical choice for a fitness area where heavy equipment is used. 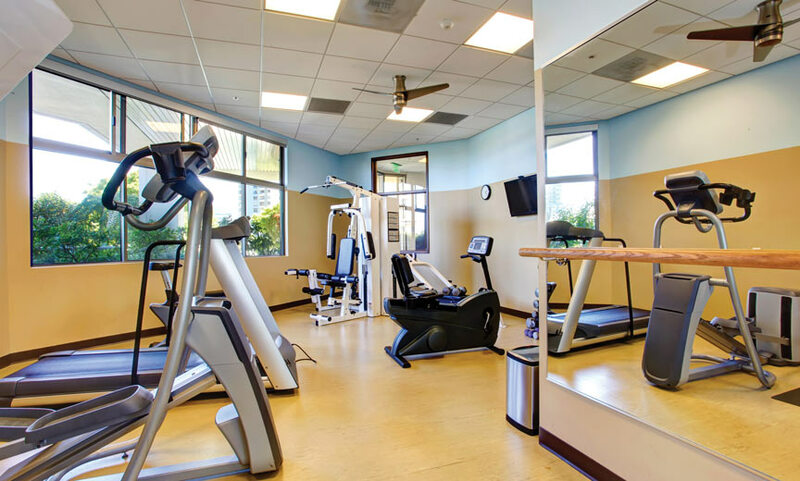 Since treadmills, stationary cycles and weight machines make a lot of noise, putting them on a higher floor is generally not recommended, unless the room will be used for low impact exercise, like yoga. The vibrations caused by machines and the weight of the equipment can damage floors and disturb the rest of the house. Basements will also generally have a firm concrete slab floor. In addition, such spaces are generally cooler and often have more uninterrupted wall space (as opposed to walls and doors). “It’s important to have a designated place to work out, where you aren’t surrounded by the distractions of regular life,” Rivera explains. “Some people place a treadmill or cycle in their bedroom, and it just becomes a giant clothing rack. Plus, the bedroom is where you sleep. It should be a restful place to reenergize. The design concepts that work in a bedroom will not be conducive to a great workout.” He also suggests clean, bright colors for a work out space, like bright white or sunny citrus colors, particularly in a basement where there may not be a great deal of natural light. Floor surfaces are also important to consider. Gym floors need to be low maintenance and durable. Sheet vinyl, tile, or hardwood flooring with a polyurethane finish are great choices, as is low-pile carpet tile, which is resilient and has the added benefit of being easy to partially replace if damage occurs in one area. In addition, carpet absorbs sound, so if you do place your gym on an upper floor of a home, you can still keep it quiet. For a free-weight area, heavy-duty mats to protect the floor are key. Rivera recommends half-inch-thick recycled rubber flooring available online. “Something that can take the impact from dropping weights will make your life a lot easier,” he says. If your fitness area is comprised mainly of machines rather than free weights, you can opt for flooring that’s more stylish and less industrial. Lastly, although it’s primarily a functional space, cosmetic choices remain important. No one wants to work out in a space that doesn’t convey positive energy and a sense of comfort. Full length mirrors help you keep track of your progress and allow you to monitor your form (considered important for yoga postures and weight lifting moves). 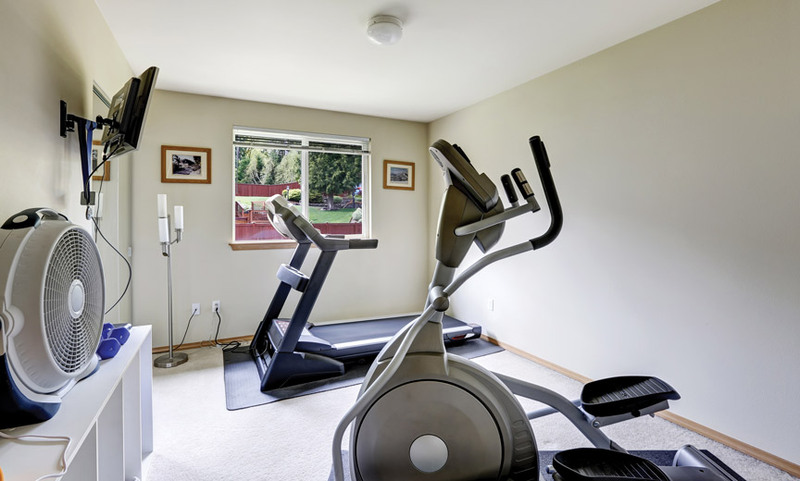 But the golden rule when it comes to planning your home gym is to design for safety. Says Rivera, “Make sure that mirrors are attached, paths are cleared of tripping hazards and everything that needs to be secured to walls or floors is secured tightly. If necessary, have a professional come in to install racks and suspended equipment. The last thing you need is to have your heavy bag fall on you. That’s not healthy.